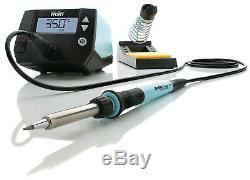 Weller WE1010NA (WE1010) Digital Soldering Station. 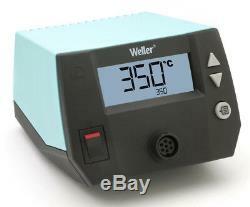 From one of the most trusted names in soldering, this Weller station replaces models WES51 and WESD51. 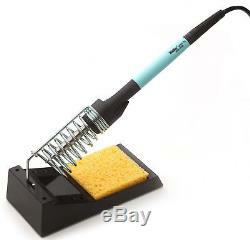 Includes additional chisel/screwdriver tips ETA, ETB, ETC & ETD Plus HTAZD10W-2 Waterless tip cleaner. Loaded with new features and improvements. 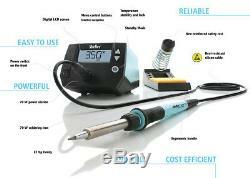 Weller introduces a new digital 70 W soldering station from the WE Line, designed for vocational, prosumer, and professional uses. 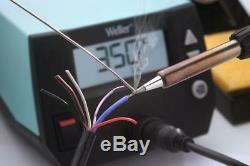 Just switch on the new WE station and start soldering immediately. 40% more powerful than the WES / WESD station. The iron's faster heat up and recovery time gets the job done quicker with more efficiency and precision. Easy to handle high performance iron. Low total cost of ownership. Reinforced safety rest for secure iron storage. Temperature stability and temperature lock protects tips and components, affording. Process with repeatable soldering results. Standby mode and auto setback conserves energy, protects equipment. 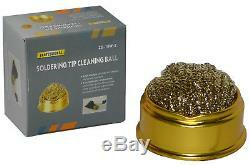 Includes extra Weller original tips & cleaner. 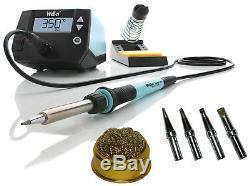 The item "Weller WE1010NA WE1010 Digital Soldering Station Tips ETA ETB ETC ETD & Cleaner" is in sale since Wednesday, June 6, 2018. This item is in the category "Business & Industrial\CNC, Metalworking & Manufacturing\Welding & Soldering Equipment\Soldering & Desoldering\Soldering Irons". 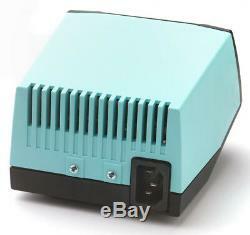 The seller is "nesselectronics" and is located in Burnsville, Minnesota. This item can be shipped to United States, Canada, United Kingdom, Denmark, Romania, Slovakia, Bulgaria, Czech republic, Finland, Hungary, Latvia, Lithuania, Malta, Estonia, Australia, Greece, Portugal, Cyprus, Slovenia, Japan, China, Sweden, South Korea, Indonesia, Taiwan, South africa, Thailand, Belgium, France, Hong Kong, Ireland, Netherlands, Poland, Spain, Italy, Germany, Austria, Bahamas, Israel, Mexico, New Zealand, Philippines, Singapore, Switzerland, Norway, Saudi arabia, Ukraine, United arab emirates, Qatar, Kuwait, Bahrain, Croatia, Malaysia, Chile, Colombia, Costa rica, Dominican republic, Panama, Trinidad and tobago, Guatemala, El salvador, Honduras, Jamaica, Viet nam, Uruguay, Antigua and barbuda, Aruba, Belize, Dominica, Grenada, Saint kitts and nevis, Saint lucia, Barbados, Bermuda, Brunei darussalam, Bolivia, Ecuador, Egypt, Guadeloupe, Iceland, Jordan, Cambodia, Cayman islands, Sri lanka, Maldives, Nicaragua, Oman, Peru, Paraguay.